The “Judicial Perspectives” panel is consistently the best attended event on CEIC’s E-Discovery track, and yesterday the judges once again filled the room to overflowing. 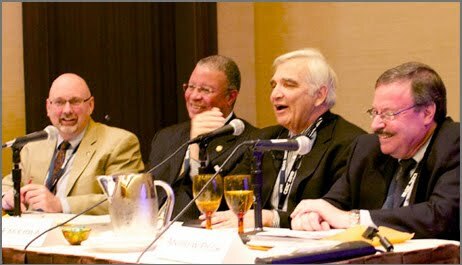 This year’s panel featured US Magistrate Judge John M. Facciola in the District of Columbia, Judge Herbert B. Dixon, Jr. of the D.C. Superior Court, and US Magistrate Judge Andrew J. Peck of the Southern District of New York and was moderated by Kenneth J. Withers, Director of Judicial Education for The Sedona Conference®. The discussion began about the “bring your own devise” (BYOD) trend, with Judge Facciola holding up his iPhone, which he purchased but for which the federal judiciary pays the monthly fees and on which he conducts official business with data stored in the cloud. “Who has possession, custody or control of my data?” he asked. It’s not held on any federally-controlled server, and not really held by the Judge himself. The topic of possession, custody and control continued with a discussion of the e-discovery challenges associated with data stored in the cloud. Judge Peck told the story of a Chief Information Security Officer who had authority over e-discovery within his multi-billion dollar company who, when told that the company could enjoy significant savings by moving to “the cloud”, questioned whether the cloud provider could accommodate their needs to adapt cloud storage with the organization’s e-discovery preservation requirements. The cloud provider said it could but at such an increased cost that the company would enjoy no savings at all if it migrated to the cloud. Discussion turned to e-discovery in social media, in which Judge Dixon noted that, in his experience, admissibility of social media was contested much more fiercely in civil cases than in criminal. The judges discussed various ways courts have attempted to handle the discovery of postings on Facebook and Myspace, including judges who undertook to examine the postings themselves to preserve the privacy of litigants postings. Judge Facciola, doubting whether judicial in camera review was a wise use of judicial resources, quoted a Pennsylvania judge who, after reviewing hundreds of Facebook postings, wrote “Why did I do that?” Judge Peck advised the audience that what litigants should avoid is a “fishing expedition” into a party’s Facebook postings, and reminded them that social media postings – which have been posted for viewing by some audience, if not the general public – do not carry privacy protection under US law. Rather, the consideration is a question of relevance under Federal Rule of Civil Procedure 26(b). These are just a few of the topics raised by Ken Withers on which the Judge’s gave their views of the law and their thoughts on where the law may go in the future. The panel of judges was “hot” and the audience was treated not only to a high-level discussion but also the evident humanity and character of each of the three judges, who were kind enough to join other lawyers that evening for CEIC’s “E-Discovery Dinner” which has become a tradition of good cheer and conversation.